Starting this spring we will begin construction on an expansion and remodel of the current Sunset Square location. The expansion will include adding an additional 1000 sq ft of space by bumping into the space next door. The extra space will allow us to enlarge our kitchen to accommodate several new menu items including an expanded selection of appetizer and a new lineup of burgers. We will also be adding a large arcade room for the kids –or the grown-ups– and a 21-and-over Pub seating section. The Pub will include an expanded wine selection with a focus on Washington wines as well as expanding our current tap line-up to include 18 beers on tap, with at least 6 (possibly more) of those taps being devoted exclusively to our amazing local breweries right here in Whatcom County. Permits have been filed and we plan on starting construction sometime this spring. This will be a floor-to-ceiling-and-everything-in-between remodel, but we will remain open and fully operational during the majority of the construction. There will be a very short shut-down, hopefully lasting less than 1 week, when we move the kitchen and lay down the new flooring in the main dining area. In addition to the remodel there will be a slight re-branding to Round Table Clubhouse which reflects the new elements of the expanded menu, added Game Room, and the Pub section which are not found at your typical Round Table location. The motto for the Clubhouse is Pizza, Pub, Play. Round Table Pizza in Bellingham and Mount Vernon has been locally owned and operated by the Sharrow family since 1985. The Sunset Square location opened in 1990 and has had a couple of minor remodels over the years but this will be the first top-to-bottom overhaul since opening this location. Keep an eye on our Facebook page for updates on our progress. We are looking forward to seeing you at our grand re-opening later this spring! We have great game-day specials for this Sundays championship matchup! 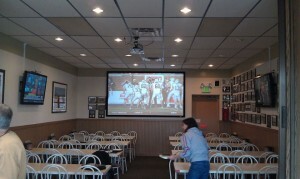 Come in and watch the game on one of our 8 BIG SCREEN HDTV’s. We will have Large 1-Topping pizzas for just $12, 50% off all appetizers, and any pitcher of beer for just $8! Already have plans to host a party at home? Same deals are good for carryout orders, we can even do the beer to-go with $8 growler fills. Also we aren’t talking to the media about this, but for the rest of the weekend we are DOUBLING our online-ordering 12th man discount. Use coupon code REPEAT to save 24% off your entire online order! Go Hawks! *Specials cannot be combined with any other specials, offers, discounts, or coupons. 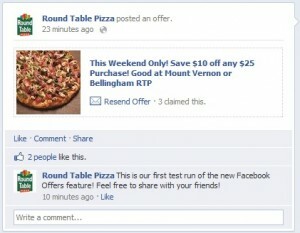 We are excited to be testing out a new Facebook feature called Facebook Offers. This allows you to claim special discounts and offers from us over Facebook. Because this service is (currently) free to use we can offer you better discounts than we normally can when mailing out coupons. 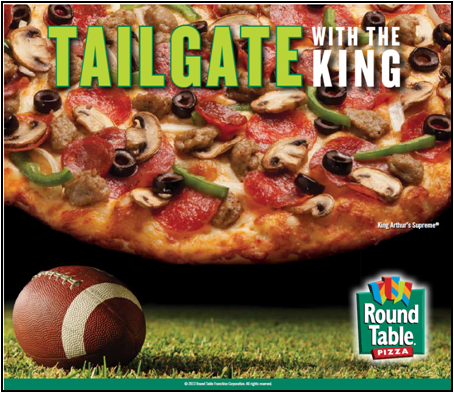 This is one of the best ways to save on Round Table Pizza. To see our offers and claim them all you have to do is like us on Facebook using the link on the right hand side of our page. You can claim the $10 off $25 coupon through May 6th, and keep an eye for other great Facebook Offers from us! Dealing with Comcast (Our Fox Soccer Channel Adventure). I want to start by apologizing to those of you who came down to our Mount Vernon store to watch the Sounders open up their season this last Wednesday. Anyone who did come down was greeted by a “not authorized” message on our televisions when we tried to turn on the game. Right away Casey called me at home to tell me that they were in fact not receiving the Fox Soccer Channel which was followed by a two day exchange with Comcast’s customer service which I will detail for you all. Comcast Service Rep. #1: Immediately after receiving that call from Casey I got on the phone Comcast to find out why we weren’t getting the Fox Soccer Channel. I know for a fact that we are suppose to get the Fox Soccer Channel and had watched it previously when we installed the TV’s. So I get the first rep on the phone and she tells me that the reason we aren’t receiving the FSC is because our bill is past due so some channels had been turned off. Now we did have a billing error that we were waiting for Comcast to correct, but that was a couple of weeks ago and I was fairly certain we were now current. Regardless she insisted we were past due. Rather than argue I ask her if I just pay over the phone with a credit card, can we get our channels turned back on so we could watch the game. She says yes and that is what I do. She tells me that she would send a reset signal to all our boxes and our channels should work soon, but sometimes it takes a little while. I tell her “fine just do it” and pay our “past due” bill on my credit card. Fast forward to Thursday morning, I get into the office and of course the first thing I find out is that the FSC never did end up coming on and we are currently still getting the “not authorized” message on that channel. We then dug out our bill and of course we were current. The amount due that Rep. #1 insisted I needed to pay was in fact not due till the following Monday. Comcast Service Rep. #2: Back to the phone we went. We get a hold of Comcast again and explained everything that happened. We spend the next 45 minutes of playing a fun game called check the channel. Basically my dad was on the phone with Comcast, and I was on the phone with Casey at the restaurant. The Comcast guy would keep spouting off channel numbers and asking us if that channel was working for us or not. Casey would then run to the TV, check the channel and report back. After this entirely pointless exercise rep. #2 still can’t figure out why we aren’t getting FSC and tells us he’s going to have to send a tech out. Comcast Tech Guy: So now Comcast sends a guy to our store to check whats going on. Once he arrives he immediately calls us at the office and tells us “well my records here show that you are only suppose to get channels 1-99.” We explain to him that is simply false. It should be obvious that isn’t true since all of our boxes are HD boxes and we are getting all the HD channels (except FSC of course). We argue back and forth about which channels we should and should not be receiving but come to the conclusion that it isn’t a technical issue that is preventing us from getting the FSC. Mark, our sale rep: So next we get on the phone with Mark. He is basically a contractor who isn’t employed by Comcast, but contracts for them to work with commercial accounts. We talk to him, and remind him when we signed our contract one of things we wanted to make sure was included was the FSC. He confirms that we should be getting all the HD channels and our sports package should include FSC. Since he doesn’t work directly for Comcast he suggest we get back on the phone with them. Yup, that’s right. Several hours of our time and 5 different reps later we finally found out that sometime between the time we signed up for Comcast and the start of soccer season Comcast lost the rights to the FSC for commercial outlets. 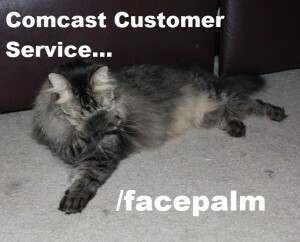 That means any bar or restaurant that has Comcast for service won’t have the FSC. So the bad news is that until Comcast and Fox resolve this issue we won’t have the Fox Soccer Channel. The good news for Sounders fans is that most of the Sounders games are on King/Kong, NBCSN or ESPN. As far as I can tell it’s just the Champions League games that are on FSC. So we won’t have the return leg of the Sounders vs. Santos Laguna this Wednesday (3/14) but we should have the MLS season opener next Saturday (3/17). Hey, Where are our TV’s? So I’ve gotten some comments from our Bellingham customers who seem to be a little jealous that the Mount Vernon store got 7 new HDTV’s and a huge 120″ projector screen, while Bellingham got nothing. I figured I’d expand on that a little bit and fill you in on what is going on. There were a couple of things we wanted to test this year to help improve our customer experience at Round Table. The first was updating the televisions in the restaurant to provide a much better experience for our customers who come in to enjoy sporting events such as the Seahawks, Marniners and Sounders. The other thing we wanted to invest in was a new computer system for the stores. Our old system is almost 15 years old now and is frankly outdated and crash-prone. A new computer system would be much more stable (hopefully!) and would have built in features which allow us to much better serve you, the customers. Unfortunately with the economy the way it is, we just aren’t able to put new TV’s and a new computer system in at both stores at the same time. So we drew straws and Mount Vernon got the short straw. Well you go and ask any member of our crew if they’d rather get new TV’s or get a new computer system I believe they would all jump for the new computer system. As a matter of fact the manager at Mount Vernon (my brother Casey) threaten to take all the TV’s down, drive them up to Bellingham and to hang them all up so MV could get the new computer system instead. Well Casey, it doesn’t work that way. Sorry. We have been doing a lot of work behind the scenes and have identified the new system we want to put in and are hoping to have it up and running in March. Now I know for our customers this may not be as exciting as the potential to come in and enjoy some Boundary Bay beer and pizza while watching the Sounders on a 120″ screen, but this new computer system has lots of bells and whistles which should allow us to provide you with much better service. We do have plans to upgrade the entertainment in Bellingham as well. And yes, Casey will also eventually get the new computer system. But we have to do these projects one at a time. Right now we are on track to have the new computer system working starting in March. Hopefully the transition will be seamless, but there may be a few bugs and hiccups along the way. So Bellingham, we ask you to be a little patient with us this coming month, and hopefully we can also get you some shiny new TV’s in the near future. Well we finally saw some nice weather over the holiday weekend, maybe summer actually is on its way. With the change in the weather we are also shifting specials. The Fire Roasted Pizzas will be phased out. I apologize to those who really enjoyed those pizzas (I know I did) but they were a limited time offering and we have used up all the supply of the ingredients. If you miss them, leave some feedback and I’ll pass it along, I’d like to see them back in the future. Moving on, we are running our new “Flavors of Summer” promotion. You can have your choice of our Maui Zaui or Backyard BBQ Chicken pizza for just $15 for a large size. So stop in and order up your favorite flavor or summer, can’t decide which, go ahead and get one of each. Also one other note, we finally brought take-and-bake up to Bellingham. So if you want some Round Table Pizza but don’t want to come back into town around dinner time, swing by and grab a take-and-bake on your way home from work, then you can have Round Table straight from your oven when dinner time rolls around. If you are a beer enthusiast (like me) I don’t know if there is a better area in the world to be living than the Pacific Northwest. The craft beer industry has exploded up here and we are really lucky to have so many great breweries to choose from. I feel like we do a pretty good job at both our stores of keeping a great rotating selection of amazing beers on tap. And I think the perfect compliment to an excellent beer is an excellent pizza! That is why we are going to host our first Beer and Pizza Pairing event at our Bellingham store Saturday, July 2nd 2:00pm-7:00pm. The cost will be just $10 and will include several samples of beer as well as samples of some of our best specialty pizzas (21+ year olds only of course). 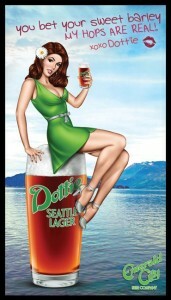 Dottie Seattle Lager – Emerald City Beer: Emerald City Beer is in the old Rainier building in Seattle and brews their Dottie Seattle Lager using almost exclusively, ingredients sourced from Washington State. Interurban India Pale Ale – Fremont Brewing Company: From sourcing their ingredients to using energy and water efficient brewing methods, Fremont Brewing focuses on sustainability, as well as making great beer of course. Their Interurban India Pale Ale is named after Fremont’s most famous outdoor sculpture, Waiting for the Interurban, Interurban India Pale Ale offers the adventurous beer lover a warm embrace of roasted pale malt swirled with a hand-selected blend of flavor malts and filled with the rich spice of Chinook, Centennial and Amarillo hops. Mens Room Original Red – Elysian Fields: Amber in color with a light hop aroma and toasty malt finish. The Mens Room Original Red is brewed by Elysian for the radio program The Mens Room on 99.9 KISW. The great thing about this beer (besides being yummy!) is that Elysian and The Mens Room donate a portion of the proceeds to The Fisher House which helps out our veterans. They have raised $94,000 for the Fisher House so far and every time you drink a Mens Room Red you are helping raise even more money to help support our Vets. So come on in this Saturday to try all three of these great beers. If you can’t make it this Saturday these beers are also on tap. But make sure you come in soon because our selection is constantly rotating so you don’t want to miss your chance to try these great beers, before they are rotated out for whatever the next great beer we stumble upon is. Brandon and Becky (our manager duo at the Bellingham store) have been bringing in a nice supply of quality local wines into the store lately. While not as traditional as the beer and pizza paring, wine actually goes great with our pizza and Brandon and Becky want to prove it. On Friday May 6th from 3:00pm-6:00pm they will be hosting a wine tasting event. We will be sampling 5 different wines with slices of some of our popular specialty pizzas. It is only $10 to participate in the tasting and there will be some other special offers on pizza and wine throughout the night. So stop by after work or come in for dinner and sample some great northwest wines pared with some of our best pizzas. I didn’t think much else was needed in the title post to get your attention, but we have some cool beer related things going on. First in Bellingham they now have a “local beer night.” It happens every Tuesday and on that day you can get any beer brewed in either Skagit or Whatcom county for a discount. Tonight I know they have Boundary Bay’s Belgium Pale on tap and in the coming weeks you can look for not only Boundary Bay but other local brews being featured at our Bellingham location. Tuesday night prices are $3 a pint or $10 a pitcher for local brews, but the beers are available any night of the week if you can’t make it on Tuesday. 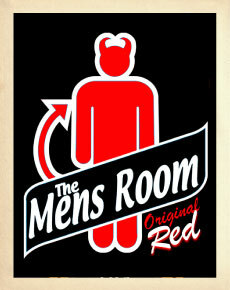 At our Mount Vernon store (which also carries a great selection of beer) we put The Mens Room Original Red on tap today. This beer is made by Elysian Brewing in conjunction with the radio program ‘The Mens Room’ on 99.9 KISW. The neat thing about this beer, apart from being delicious, is that a portion of the net proceeds from every Mens Room Original Red sold goes to helping support the families of our military vets through the VA Puget Sound Fisher House and Ft. Lewis Fisher House. The only thing better than enjoying a beer is enjoying a beer for a good cause! Also at Mount Vernon we recently started carrying North Sound Brewing’s Hop Chops IPA, brewed here in Mount Vernon. It is one of my favorite beers that we have on tap right now. So you can come on down and try a Hop Chops, or if you want to sample all of North Sounds beers head to their tasting room and we can deliver some pizza out there if you get hungry. 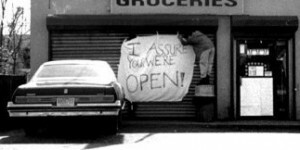 I assure you, we’re open! Thanks to a strange sequence of events, I have been fielding a lot of “are you guys open?” phone calls. First there was this news about corporate filing for bankruptcy, then thanks to a mix-up with phone providers our phone system was disconnected for several hours last Sunday, then Snowmaggedon ’11 hit. So as I was down at our Mount Vernon store shoveling snow, thinking to myself “I’m not even suppose to be here today” I realized I should probably spread the word that it’s business as usual for us. Again I want to reiterate that we are independently owned and operated and we are not a part of the bankruptcy filing. If you tried to call our Mount Vernon store last Sunday and got a “this number has been disconnected” message, it was just a mix up with the phone company. Our phone number is back up and working and remains the same (424-7979). We are switching providers on Monday so there might be brief outrages, but they are suppose to have that all wrapped up before 11:00am. Although the mix-up last Sunday doesn’t inspire confidence… so if you try to call on Monday and can’t get through, try again in a few minutes or just order online, we will be there. Lastly, we try our best to remain open despite the weather. While we may limit our delivery areas and/or close down a little early for the safety of our employees, for the most part we try to operate normally even during inclement weather. It’s going to take more than a mere 18″ of snow to slow us down! So if this cold weather has got you shivering, we will be happy to warm you up with our new Fire-Roasted Pizzas. Come on down and try one, they are on special. If you are still snowed in, we will try our best to bring one to you. Built on Thesis. Thesis theme skins. Copyright © your awesome site!